The Online Appointments feature doesn't require that customers pay for services in advance. However, you can do that at any time by connecting Online Appointments to one of the available payment systems. If you haven't enabled Online Appointments, see Add Online Appointments section first. Click Open in the Appointments panel. In the top bar, click Appointments and choose Payments. Select Require full payment when booking online or Require deposit when booking online and enter a deposit amount, then click Save. 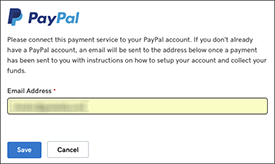 Once the Success confirmation appears, click Connect for a payment method you want to add. Select Pay in person or send an invoice and when the Success confirmation appears, click Website in the top bar to return to your site's main window. 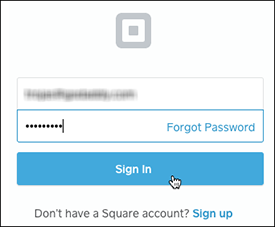 If you already have a Square or PayPal account, log in. Otherwise, follow the prompts to create an account for either one or both. 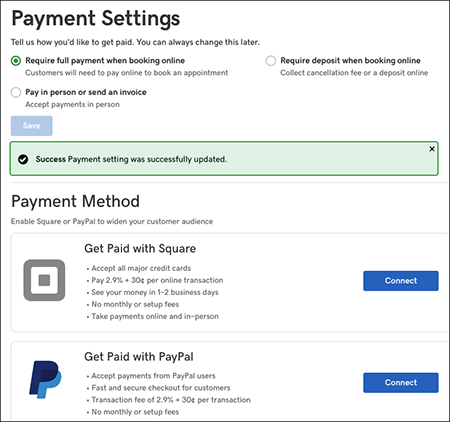 When the Payment Settings window reappears, you can add another payment method. When you're done, click Publish Your Site so you can begin accepting payments from the payment service(s) you've added.